The Selke Trophy, awarded annually to the forward who demonstrates the most skill in the defensive component of the game, is generally the province of centers. In January, Tampa Bay Lightning coach Jon Cooper made a case for Ondrej Palat, who plays on the left wing, to break the run of centers winning the award for each of the past 10 years. "I still believe Palat is the straw that stirs the drink on that line," Cooper said. "He's oozing with hockey sense and he's skilled. He is like Patrice Bergeron as a winger to me." Opposite Palat in the Stanley Cup Final is Marian Hossa, another defensively skilled forward whom the Selke has eluded. Each of these players, though, is key in their team's defensive schemes, and each will be relied upon in that capacity for Game 2 of the Stanley Cup Final on Saturday (7:15 p.m. ET; NBC, CBC, TVA Sports) as the Tampa Bay Lightning look to even up the series with the Chicago Blackhawks. Hossa and Palat each play on the wing: Palat on the left and Hossa on the right. 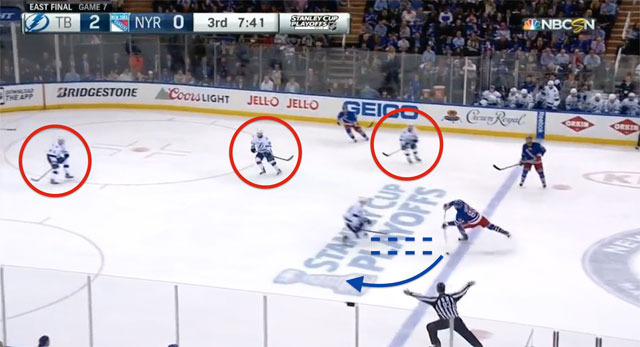 On any given shift Hossa could be lining up opposite Alex Killorn with Steven Stamkos a short distance away. Palat may be matched up against Patrick Kane with Brandon Saad in close proximity. There will be shifts when Hossa and Palat line up opposite each other. Hossa and Palat make their respective teams better in the defensive areas each team stresses as part of their identity. The chart below shows how some numbers changed this season when Hossa and Palat were on the ice. Though Hossa and Palat don't have the same defensive responsibilities as a center, their play can be equally important; and their quality of competition is just as stiff. Hossa is one of the most persistent and effective backcheckers in the League, using his skill set and ability to position his body to excel at an activity that often puts the defending player at a disadvantage. On this play against the Anaheim Ducks in Game 2 of the Western Conference Final, Hossa makes up ground on Ducks defenseman Sami Vatanen and helps neutralize Anaheim's transition. 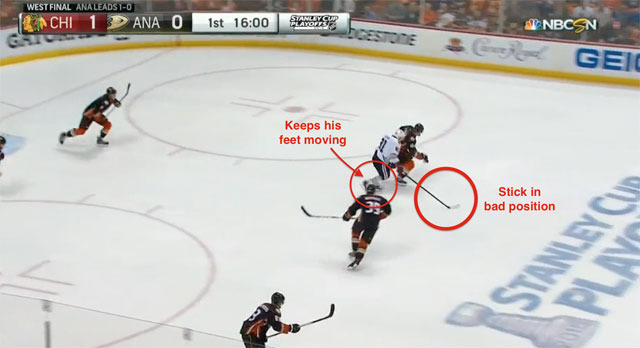 When Vatanen begins to turn up ice, Hossa is already close enough to make a play, but not a safe play. Vatanen is using his body to shield the puck, and Hossa chooses not to swing his stick across Vatanen's body, where he might get called for a trip or hold. 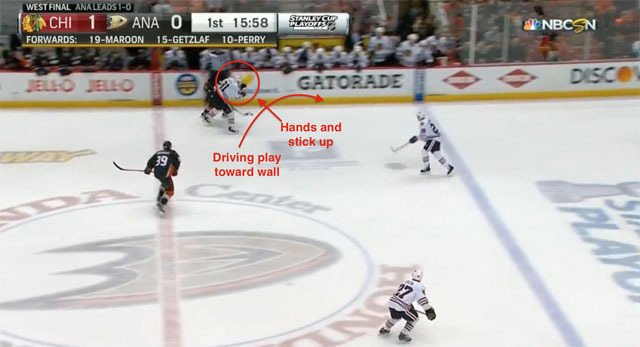 As Hossa continues to chase Vatanen, he shrinks the play and the ice by driving him toward the wall. He keeps his hands and stick up, leaving no doubt he's legally defending Vatanen. Finally, Hossa finishes his check through the body, not using his stick or hands, and separaties Vatanen from the puck. Hossa waited until he was in optimal body position to make a play after chasing Vatanen for approximately 100 feet. 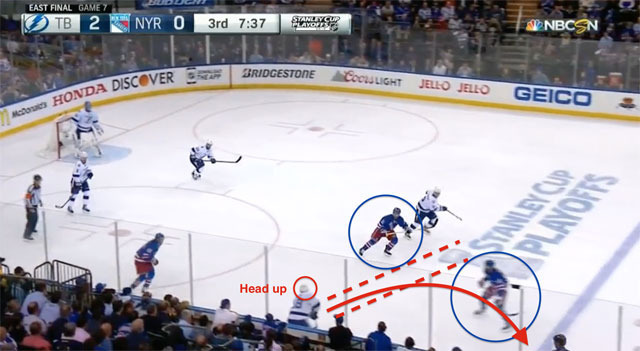 To Cooper's point, Palat is very good at reading the action in his own zone, and making the high-IQ play. Part of what allows the Triplets line, which also includes Tyler Johnson and Nikita Kucherov, to speed through the neutral zone is the turnovers and possession Palat creates below Tampa Bay's blue line. On this play against the New York Rangers in Game 7 of the Eastern Conference Final, Palat breaks up an offensive chance protecting a 2-0 lead in the third period, and then makes a prudent but effective clear. Rangers defenseman Keith Yandle takes a pass from forward Martin St. Louis. The puck is ahead of Yandle, forcing him to reach and accept it on the backhand. Making a quick decision, Palat jumps the new location, changing the shooting lane at Yandle's disposal. With three players in support behind him, Palat goes down to block the shot. Should Yandle choose to fake the shot and skate the puck to the right of Palat, Tampa Bay additional skaters which can support at the second level. Palat knows that he's either getting a shot block or funneling the play into more traffic. As Tampa Bay regains possession, Palat has a chance to get a zone exit. Instead of trying to feather a pass between two Rangers, Palat makes the safe play up the wall. 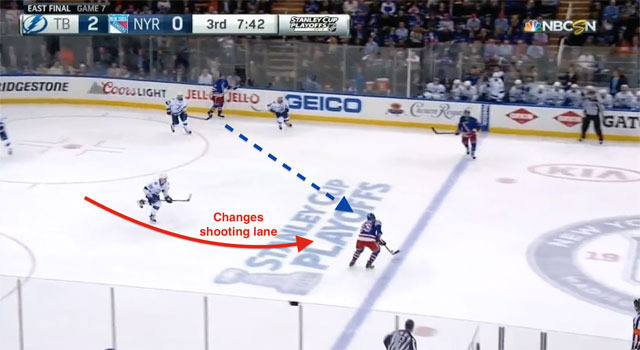 It is not the preferred controlled exit, but it does force New York to regain the offensive blue line. They're not always plays that show up in a box score, and neither Hossa nor Palat take faceoffs, but their defensive prowess is paramount to the success of their team. Playing on Tampa Bay's most productive offensive line, Palat allows center Johnson and Kucherov to play their offensive game. When playing with center Jonathan Toews, Hossa makes up the best defensive forward duo in the League. Each player will be working in the trenches on Saturday and for the rest of the Stanley Cup Final in hopes of giving his team a defensive edge.